As Costello begins to talk about Hughes and primitivism, I can’t help but think of thanksgiving. To some degree, I feel Costello is criticizing the notion of respecting an animal for its worth, and killing it to take its practical worth ( as a piece of meat) after showing your gratitude towards the animal. For the bull you “eat him too, after you have vanquished him, in order for his strength and courage to enter you. Look him in the eyes before you kill him, and thank him afterwards. Sing songs about him” (Costello 97) For the turkey and other grand meals that we share, we thank the divine, our family, those who helped prepare the food, and work hard to show our appreciation. Even the government shows its gratitude towards the turkey by saving one from the slaughter each year. In both cases, I think humanity shows a little more dignity by showing its thankfulness. I am quite sure that I would hold great disdain for the man who kills either animal without second thought, devouring the animal without understanding of the loss of life required to nourish him. Whereas a person who his thankful for the meat an animal can provide and shows their appreciation before and after killing it seems more morally acceptable to me. 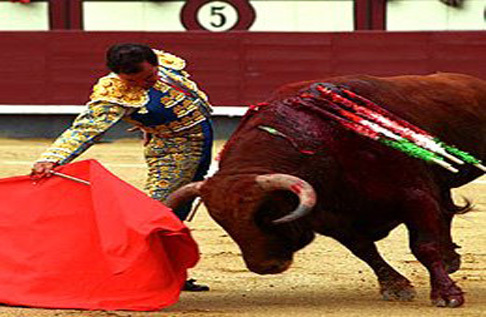 Bullfighting: Are we really respecting the animal's value? Costello discusses an interesting point about man and ecology. Some argue that because man is the only creature that can understand the interactions between creatures and nature, that he is given the right to control the lives and deaths of those creatures and ultimately, their interactions with each other. How can we give ourselves the right over the lives of such a variety of species? I believe this is a huge jump in conclusions. First, we obviously do not understand ecology enough to keep things running smoothly so to speak. For example, several species have gone extinct prematurely due to our failure to regulate our own actions. Also, I do not have the right over another person’s life if I understand everything about them. If I have a child and I know them like the back of my hand, I don’t have control over their freedom and their right to life. Does Intelligence grant us Rights? Costello discusses refutes near the end of her debate with O’Hearne the idea that Apes, as the smartest of animals besides humans, do not exhibit nearly as much mental capabilities as we do, cannot express their thoughts as well, and cannot appreciate life like we can. I saw some problems with both sides of the argument. First of all, against O’Hearne, intelligence is a poor determining factor for the right to life. A genius without morality may lose his right to life after becoming a psychopathic serial killer. Likewise, a young child who hasn’t developed intellectual skills, even disabled children who never will be able develop these skill to their fullest extent, deserve a right to life. On the topic of freedom, doesn’t an animal have the right to enjoy the life that nature designated it to live in? If “freedom is reckoned among the most sublime feelings, the corresponding disappointment is also among the sublime.” (Anthology 367) This disappointment being the grand irony in our failure to recognize our imprisonment of animals like slaves. On the other hand, I would like to address Costello’s argument about an animal being able to “speak” to a person without actually speaking. She mentions the story of a hen that speaks to a little boy by “imprinting itself on the boy’s memory so hauntingly in 1958 he wrote an impassioned attack on the guillotine.” (Costello 108) I think this is no more than a boy’s reaction to his surroundings. If I see a great redwood being chopped down and it saddens me to the point that I fight against the guillotine-which is just as plausible- the redwood hasn’t “spoken” to me, and the redwood doesn’t have a right to its life for its capability to instill this feeling in me, because again, I am installing the feeling in myself, not the redwood or the hen. While hens may not be able to communicate their ideas. This gorilla can. What rights does this grant Koko the lowland gorilla? While she may not fully understand the origin of evil, she can definitely recognize it in her experiences with people’s love for pain and their lack of compassion. It saddens me that she does not recognize goodness and altruism that courses through life just as evil does. Perhaps evil is just ignorance. A person’s inability to find the good that exists in all of us. To me, evil is just an absence of virtue we all possess.